Though there have been many changes to the game of football over the years, there are certain components that have remained mainstays, such as brightly colored uniforms, scores of adoring fans, and cheerleaders. Cheerleading as a sport is so integral to the game that even the Puppy Bowl has its own cheerleaders. But while the presence of sideline supporters has remained, there is one big change at the 2016 Puppy Bowl: the cheerleaders are chickens, instead of last year's hedgehogs. Yes, you heard that right. Chickens. Although it’s widely acknowledged that Super Bowl 50 will be worth the watch for fans of the NFL, Beyonce, Coldplay, and witty commercials alike, there is one demographic that was oddly looked over before 2004: animal lovers. It doesn’t take a genius to realize that some people would rather look at adorable fuzzy creatures than watch, well, pretty much anything, especially three hours of a sport that they barely understand. In the past, the Puppy Bowl has featured all sorts of cute critters, including a bird named Meep who Tweets live updates throughout the game, and a squad of hedgehog cheerleaders. Though I am no chicken enthusiast, I do appreciate their plucky resolve and wouldn’t mind having some of these especially cute chickens running around my place. 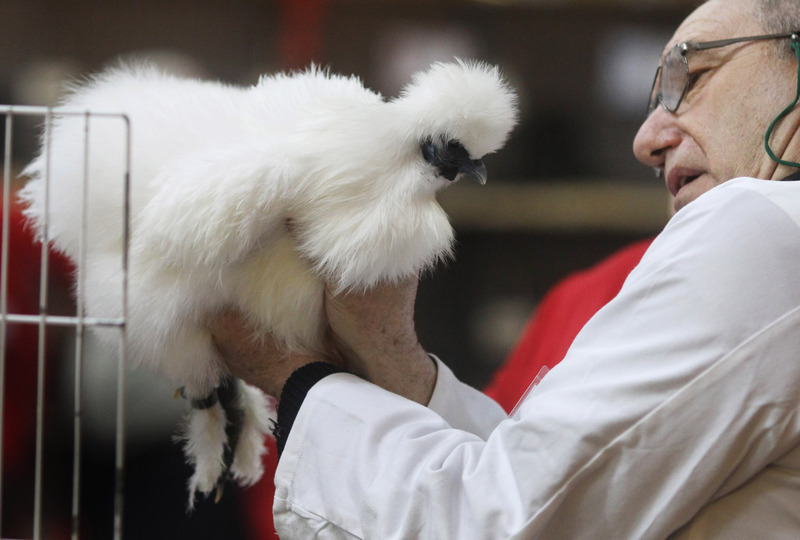 So, can you take one of these fluffy amazing chicken cheerleaders home to your coop? Let’s investigate everything there is to know about Puppy Bowl XII's new cheerleaders. The reason the birds are so amazingly fluffy is because their feathers don't have "barbs" to hold them down, like regular chickens, according to farming blog Imagine Acres. There are so many beautiful layers to these fuzzballs. Imagine Acres also explains that Silkie chickens have black bones and skin, a stark departure than a typical pale-skinned chicken, and also have blue earlobes. The blog states that sSilkies are often kept as pets because of their inability to fly and generally docile nature. Though the Animal Planet website specifies that all of the puppy bowl players are adoptable from 44 shelters across the nation, it does not remark on the adoptability of the five amazing chicken cheerleaders, though I am really crossing all of my fingers here that I can bring one home someday.